Out here in the desert, you won't be gardening or planting for very long before you hear about mulching. Mulching is the goddess of desert gardening, how you keep water in the ground, how you keep things alive, possibly the reason for world peace, based on the love desert gardeners have for this stuff. The end result of the study was that organic mulches can absorb water, and when they do, they lose water more rapidly too. So soil with rock mulch on top lost the least amount of water. One might conclude from this study that rock mulch is the best type of mulch for desert gardening. 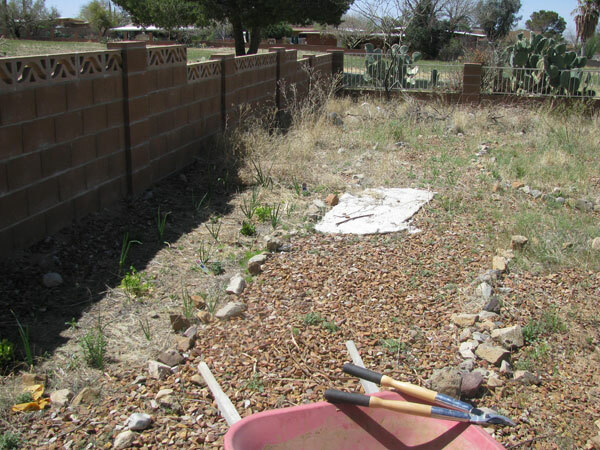 We see it everywhere here in the Southwest, after all, covering entire yards with fields of rocks on top of plastic to keep the weeds from poking through. However, water retention alone is not the only consideration here. So, I'll take a quick look at rock mulch now, and look at other mulching methods a little later. Rock mulch helps the soil retain more water than other forms of mulching, at least according to the above study (and other resources, too). With plastic underneath, it can keep weeds suppressed, too. It can be pretty with pretty much zero upkeep, as well. The plastic underneath the rock mulch is one of the big negatives, for numerous reasons. Most of us have or know someone who has black plastic covering a yard that is covered in rocks on top of that. Now, while rocks or other mulch on top of plastic seem to be slightly cooling, you need to make sure it is kept up and kept entirely covered by rock, because plastic without mulch actually raises the temperature of the soil by between 5-10 degrees, depending on whether it is black or clear plastic. In many colder areas, this is not a problem and can actually be a good thing. It might even be a good thing here for a tropical plant you are trying to keep alive in the winter season. But for the temperatures we get here in the desert, that heightened temperature might be enough to cause problems for the plants and potentially even the bacteria and enzymes in the soil that we need to have healthy soil that is good for our plants. The plastic also prevents air from entering or leaving the soil. As the above factsheet mentions, "adequate root system to support vegetative growth will not develop under plastic, which prevents adequate root intake of oxygen." So when you have plants anywhere in your rock-on-top-of-plastic yard, they are going to be struggling. And the plastic prevents water from entering of leaving the soil. When water can't enter the soil, that means that every single rainfall here is falling into your yard and evaporating off the top of the plastic rather than getting to your plants. Or it is rushing over your plastic until it hits soil that does not have plastic, like your neighbor's yard. Or the sewer. 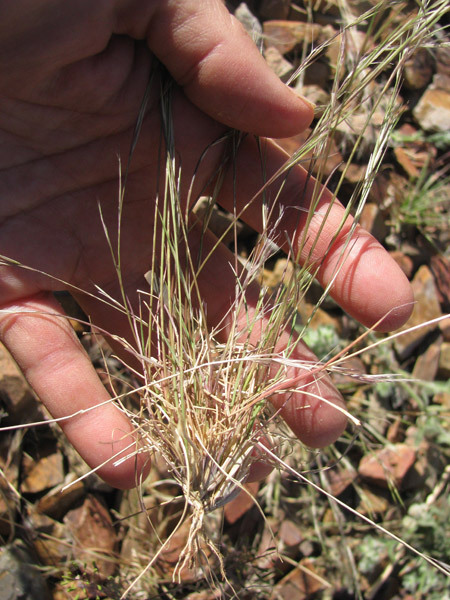 While some of your plants will get a little water near their base where there is a hole in the plastic, there is something we need to be aware of, which is that here in the desert, some plants survive by getting water from very shallow, very wide root bases. The plant is expecting to obtain water from a large area, and when they are only allowed a small area from which to access water, they don't do so well. One of the most well known plants of this kind are the saguaro cactus, which have a root system that is about as wide as the height of the cactus. If you've ever seen those Saguaro's in and around the cities that look like they are struggling, now you know one of the reasons why: they don't have enough space to grow out their roots to grow and prosper. Nutrients in the soil is another negative, or rather, a lack of positive. Here in the desert, we sometimes worry so much about the water-saving properties of a substance that we may forget about other considerations, like adding nutrients back into the soil. Organic mulches, like woodchips, hay, and compost, will slowly breakdown and can add nutrients to our soil. The rocks can't. If you are lucky enough to have rich soil, then this isn't a worry, but for many of us, we may want to be looking at something that is giving us more bang for our buck, as it were. Rock mulch can raise the temperature of the surrounding area in ways that can affect non-desert plants especially. Honestly, I've always wondered if it might do this, in part because my plants have done better with organic mulch, or even bare dirt, than they have with rocks all around them. It turns out there's some debate on this issue. I have found numerous gardeners and gardening sites recommending rocks as a great way to mulch in the desert. I know it's done here in the Sonoran desert a lot. But again, I point you back to the 'my plants keep dying' data point. So, what's the answer? Is rock mulch good or bad tempature-wise? The answer seems to be: it depends. If you look carefully, rock mulching is often being recommended in areas that do not suffer from such extreme temperatures as we get in the Sonoran Desert. Typically, I'm seeing this recommended in places that rarely get up to 100 degrees all summer. "In hot regions like the South, rocks can radiate heat and cause extreme temperatures around plants," says Gary Wade, professor and extension coordinator at the University of Georgia. "This encourages water loss and can result in severe plant stress. On a hot day, rock mulches in full sun can cause the temperature around the plant to soar into the triple digits." The above professor is teaching at the U of Georgia, which is located in Athens, Georgia. There, the average high summer temperature is 91. The record high is only 108 degrees. Based on his statement there, at the very least, rock mulch can raise the temperature around a plant by as much as 10 degrees or so, if not more. After everything I've learned about rock mulching, I'd say that I don't think I'll be using it. The only way I'd consider it would be if I wasn't putting down plastic underneath, but if you don't do that, you end up with rocks and random weeds everywhere, which is just not that attractive. Now, I'm happy to have extra rocks in my yard, for the plants that need them. And perhaps some strategic rock placement could help retain moisture for some desert hardy plants that are in such poor soil that it's not holding water very well. But in and around my food garden, and where I want to slowly grow my 'desert food forest,' essentially, I don't think rock mulch is going to be in my yard's best interest. Besides, if I put in more plants rather than rock mulch, they are going to be providing shade, food for my family, food and shelter for birds and bees and butterflies that we can enjoy, and it's not going to increase the heat in our yard. I think that's more what I'm looking for.